The International Coach Federation has raised the standard of professionalism in coaching by creating a list of 11 competencies that define excellence in the field. If you are preparing to apply for a credential, or you are teaching competencies in your coach training program, this is an essential look at the fundamentals. The 11 ICF Coach Core Competencies are divided into four main categories. This book covers the first category, Setting the Foundation. You will learn about meeting ethical guidelines and standards in coaching, and establishing the coaching agreement. Building on the last book, Setting the Foundation, this book covers the second competency category, Co-Creating the Relationship. You will learn about establishing trust and intimacy with the client, and maintaining coaching presence. Building the core competency framework further, this book covers the third category, Communicating Effectively. You will learn the deep communication skills used by professional coaches including active listening, powerful questioning and direct communication. Working with clients to meet their goals involves discussion and action planning. This book rounds out the competency framework by covering the fourth and final competency category, Facilitating Learning and Results. You will learn the importance of creating awareness, designing action, planning and goal setting, and managing progress and accountability in coaching. I wrote this ebook for everyone who is living the drama of trying to push an ever-increasing number of demands into an already bursting agenda. If you’ve ever found yourself awake at 3 a.m. worrying about the next day and all you have to do in it, this little ebook is for you! Cathy provides the reader with not just a clear understanding of the importance of each competency but how to continually develop them in your coaching practice. She presents strategies that are practical and easy to integrate. She also shares valuable resources that she uses in her own coaching practice to develop her skills and keep organized. I highly recommend this book to all coaches, whether you are just starting out or have been coaching for years. It provides suggestions on how to implement continuous improvement as part of your coaching practice. Thank you for sharing your wisdom Cathy! 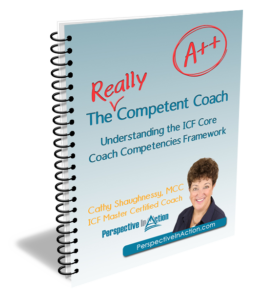 In The Really Competent Coach – Understanding the ICF Core Coach Competencies Framework, Cathy Shaughnessy offers a clear, concise, and thoughtful analysis of what coaching competencies are along with a developmental path for beginning to attain those competencies. Her presentation of the four foundations of the ICF Core Competency Model offers the developing coach clear framework for thinking about the competencies in the context of actual coaching conversations. A really useful resource. 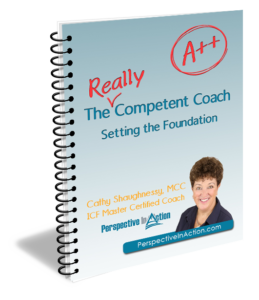 Molly Gordon, MCC, Shaboom Inc.
Cathy Shaughnessy has made a significant contribution to the coaching profession with this informative and insightful guide to the ICF Core Competencies Framework. Her style is thorough and engaging, making her content easy to engage with and understand. The Really Competent Coach – Understanding the ICF Core Coach Competencies Framework will help any coach recall, retain and align more fully with the core coach competencies. Cathy Shaughnessy’s overview of the ICF’s key competencies serves as an excellent roadmap for progressing beyond effectiveness. She has excelled in creating an easy to read and apply approach to mastering the competencies and elevating your coaching skills to a new level. An excellent resource for new and developing coaches as well as those of us who recognize the need for continuous lifelong growth. I have just finished reading the first book in the The Really Competent Coach series. It has demystified the competencies by setting up a clear and practical framework to approach them. It has given me a plan to integrate them into my coaching practice. I am looking forward to the next book! Thank-You! Truly understanding the competencies is hard. It wasn’t until I was closer to the end of the 60 hours of coach training with Cathy that I began to get a better sense of what they are. This ebook helps to simplify and explain them and provides helpful suggestions on how to work towards becoming an even more competent coach. I can’t wait for the next four ebooks to dive in more deeply! This is a quick and straightforward overview of the ICF competencies plus a very simple starting guide for new coaches. As someone who has just left my previous employer after 18 years to start my own coaching business this advice can be overwhelming. Not this! It has taken me back to basics again – a good thing! 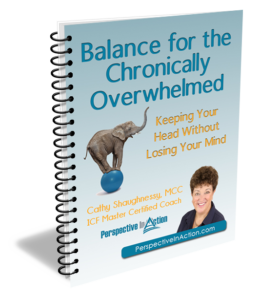 Cathy’s ebook is a great “go-to” refresher on the basics of the ICF competencies. ‎Her style is easy to read and easy to understand. Looking for a mentor coach? Book a quick chat with Cathy to answer any questions you have about mentor coaching.